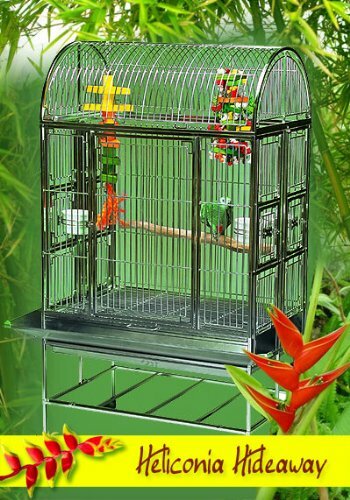 Stainless steel bird cages are far superior to normal bird cages. They are longer lasting, rust resistant, visually beautiful (especially with a polish) and are made from a non-toxic, bird safe material. However, there is one main drawback that I’m going to reveal to you in this article. Long lasting and durable – a lot of bird cages will only last a few years but a stainless steel one is built for a lifetime. In fact, it might even outlast you. Rust resistant – stainless steel doesn’t rust so you don’t have to worry about water breaking down and corroding your cage over time. Paint and rust problems won’t be an issue anymore with stainless steel! Bird safe and non-toxic – stainless steel is extra bird safe because it doesn’t require a paint or coating layer which often gets scratched off or eaten by birds. Also, because it’s strong it will be hard for your bird to break or bend the bars. Good outside – because of this rust resistance, stainless steel makes a great outdoor bird cage. Beautiful – especially when polished, stainless steel really shines. Extra strong – the extra strength from stainless steel will prevent those curious parrot beaks from manipulating any bars and wires on your cage. Lacks nuts and bolts – stainless steel is often welded together throughout the entire construction thus not needing any nuts or bolts. This means your birds have one less potential hazard to chew on. Hygienic and Bacterial resistant – According to ASSDA, high quality stainless steel is made with the same steel that gets used in hospitals and pharmaceuticals. This is non-porous so that bacterial has fewer places to hide and so is more sterile. 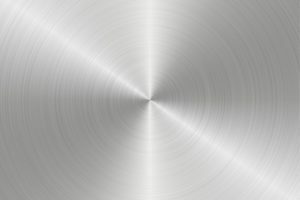 Our guide to cleaning stainless steel is listed below here. So you might be wondering, with all of those benefits listed above, why aren’t all birdcages made from stainless steel? Why does everything get made from wrought iron with powdered coat paint instead? Well the reason is simple. It is because stainless steel is much more expensive when compared with a traditional bird cage made from iron. However, consider the fact that many parrot and macaw species can live for decades. Instead of having to buy a cheap bird cage which will only last a few years, if you buy a stainless steel one then it’s likely to last a lifetime. So if you invest now, you’ll save money in the long run. But if stainless steel is currently out of your budget, then you might want to check our article on the cheapest bird cages. Which Bird Species Are Suited For Stainless Steel? 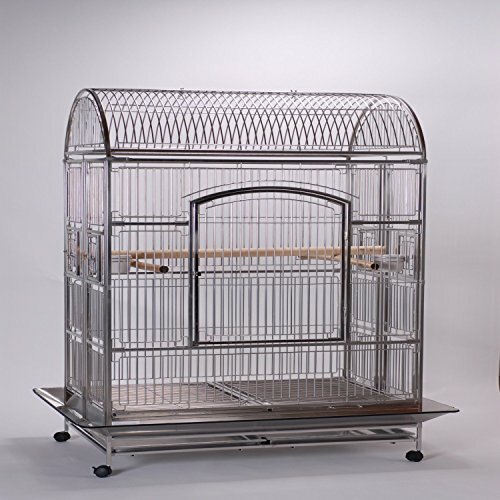 If you want the best quality parrot cage available, then look out for stainless steel bird cage that is made from 304 grade or 316 grade stainless steel. The quality of this steel is so high it gets used in hospitals and for surgery. This is because it is especially non-porous and thus more bacterial resistant. However, according to Reliance-Foundry.com 304 grade stainless steel cannot be cleaned with chloride substances (as it will corrode the steel) but 316 stainless steel contains molybdenum allowing it to withstand chloride cleaning. Both grades make perfectly good bird cages. We reviewed all of the stainless steel bird cages by looking at the build quality and craftsmenship of the bird cage. We considered how easy the cage was to use, it’s size and what type of cage it was (standard, travel, double). Finally we had a look at any additional features or accessories that were included, then compared all of these factors to the price of the cage when making our decision. Well built, strong, lightweight and sturdy. Easy to move around your house smooth sliding wheels. Storage area for additional items. Feeding trays can be externally installed if you choose. As with other cages of this size, bar spacing may be too big for smaller sized parrots. This is the best stainless steel cage of the group that we reviewed because of the quality of the craftsmenship and materials used. 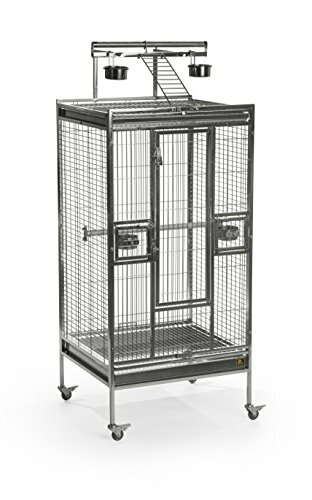 Made from medical grade steel, the cage contains all of the features you’d need for larger birds. Additional feeding and watering cups are also available. 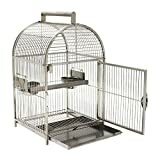 This cage from BirdCages4Less is a bigger version of a similar cage called the Java Hut (also from the same manufacturer). 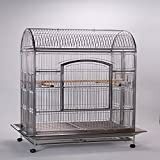 If you need something that’s sturdy, lightweight and will last you the lifetime of your bird then go with this cage. Large seed guard stop stops bird waste from hitting the floor. Contains a large wooden perch. Feeding trays are easy to access and swivel. No storage area but there is lots of cage space. Western Pacific is not a well known manufacturer, but the build quality of this bird cage is still up to the commendable standards of other bird cages. The extra large seed guard provides additional protection for your floor and the height of the cage will be welcomed by any macaw parrot that uses it. The lightness of this cage combined with the swivelling castor wheels makes this cage easy to transport. Ideal for larger sized birds such as Macaws, Amazons, and African Greys etc. Textured perches are good for providing foot exercise. Has a built in play top that will keep your birds occupied whilst they are outside of the cage. Door locks designed to be bird proof. You won’t have a storage area underneath the cage but this means your birds get more flying space instead. 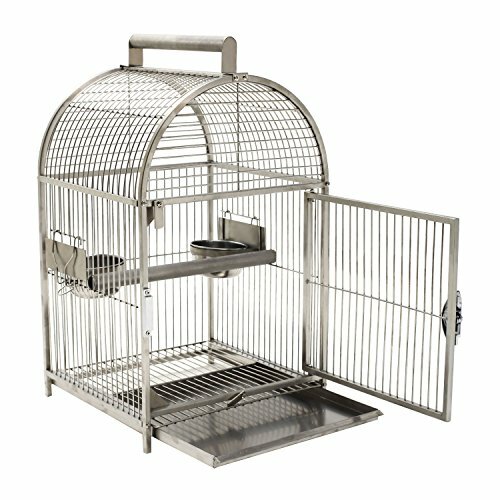 Prevue is a bird cage manufacturer that’s well known and trusted for their range of cheaper, wrought iron bird cages. So when they released this cage, they were breaking the mold by attempting to create a high-end stainless steel cage but on a lower budget – and we believe they managed to achieve it. Additionally, this cage comes with a playtop, for your birds to rest on when they’re out of the cage. Whilst almost as good in quality as the more expensive options available, it certainly is better value for money. What’s more, everything on this cage is stainless steel, including the playtop. Stainless steel that is made in the USA for all you American patriots out there! Huge amount of space, even width wise. 4 feeding doors and a huge front access door. Easy to assemble, especially if you follow their setup video (see below). Stylish dome roof and large mess guard to catch any waste. Out of the range of most peoples budgets. Basic video guide on how to set up a Featherland cage. 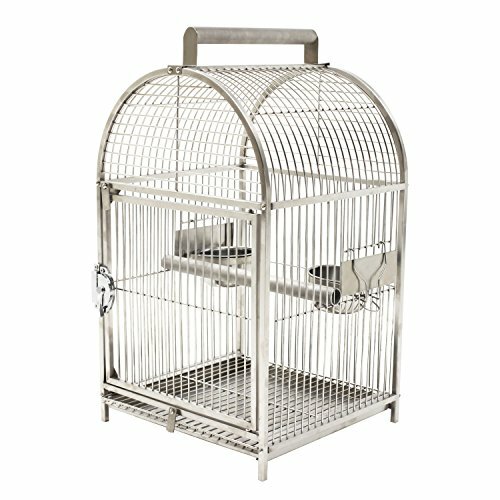 We’ve included this double stainless steel bird cage for people that have two birds and need extra space. This premium option is perfect the experienced or high end aviculturist. If you have the cash to splash, then your birds will love you for it. This is more of a lifetime investment in your birds well being than just a simple purhcase. Very strong and durable, which is needed when transporting something. Ideal for emergencies or as a temporary back up cage. 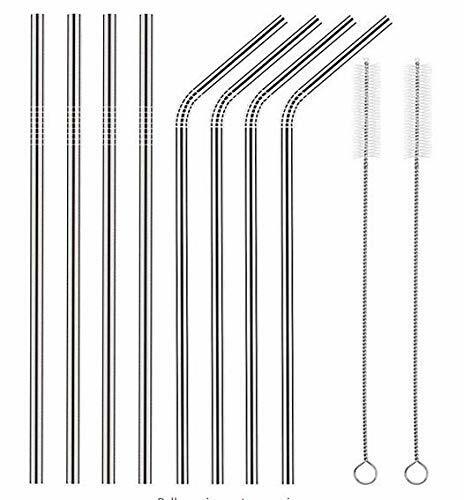 Good quality handle makes it very easy to carry. Some people complain about the positioning of the feeder/water bowl. This cage is recommended as an additional purchase in case you ever need to travel with your bird or take them on a trip to the vet. It is also ideal if you need your bird out of your main cage during cleaning, or to temporarily separate birds that are fighting. Aimed at anyone that wants a strong and durable travel cage that will be able to withstand any knocks when it’s transported. Very lightweight as well. Because stainless steel cages are very expensive and are made using only the highest quality craftsmenship, they’re not something that is normally sold by foreign Chinese manufacturers. Because of this, a number of bird cage companies will manufacture their stainless stell cages in the USA. If having a cage made in the USA appeals to you, then look out for cages made by A and E Cage Company or Featherland/Caitec. 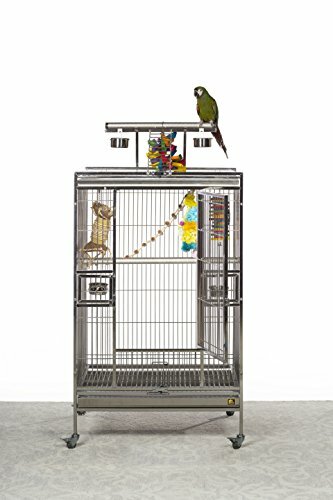 The main thing that stops most bird owners from adopting a stainless steel bird cage is that they’re simply too expensive to buy. 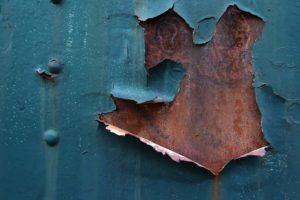 This is why a portion of bird owner’s try to find used stainless steel cages for sale – however, there’s a few issues with this problem. Firstly, as the cage isn’t being sold officially first hand, you need to be able to tell the difference between normal steel and stainless steel. This can be very difficult if a layer of paint has also been applied. Second, you also need to check for any hidden cracks or breaks that may not be entirely obvious if you’re browsing past the cage. If you do find something that needs fixing then you’re going to have to also find stainless steel replacement parts. Third, if there are any issues with the cage then you’re not going to have a warranty so you’re not going to be able to return the cage. Fourth, you’ll need to organize your own transport to pick up the cage and something like a pick up truck may be needed. Plus, you may be required to dismantle the cage and put it back together again for this trip. If these drawbacks don’t put you off then first read our guide to buying a used bird cage which is available here. Then start off your your search in the usual Craiglist, Ebay and Gumtree locations. Feeding and watering trays come into contact with your bird a lot and are frequently chewed or bitten. So a material like stainless steel works well because it is very strong and bird safe – the one on the right is available here. This is why you’ll often see bird cages which are made from wood or iron deciding to have their trays made from stainless steel (even if the rest of the cage is made from something else). According to BarkThink, animal feeding and watering trays made from stainless steel are particularly good because they are (BPA free), BPA being a dangerous health hazard which is found in many plastic bowls and feeding trays. 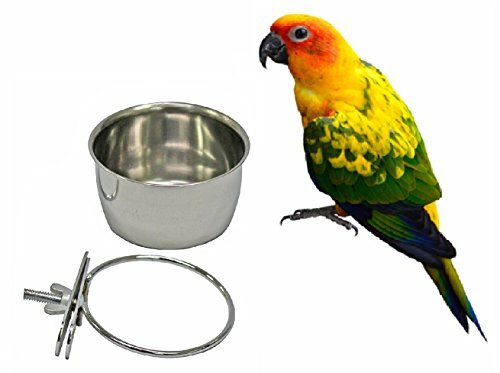 Similar to the feeding and watering trays, stainless steel bird skewers and food hangers will be bird safe and durable. A number of pieces of bird food can be stuck onto these skewers for your birds to chew on. The one in the picture is available here. Stainless steel cages are durable, strong and rust resistant – so cleaning and looking after you cage is fairly easy. An advantage is that you can use water to freely clean your cage because there is no chance of it rusting the steel. So you don’t need to worry about drying every single drop off the cage like you would with an iron cage. A simple method is to take baking soda, combine it with water and wipe down your cage using this solution with a cleaning cloth (some people even just use vinegar). Just make sure you’re not using anything that might scratch the metal such as steel wool or wire wool. However, there are some types of cleaning solutions you should avoid such as chlorine, spirits or alcohol. An alternative cleaning solution that you can buy is Poop-Off which is specifically made for cleaning bird waste. Why are you interested in a stainless steel bird cage? 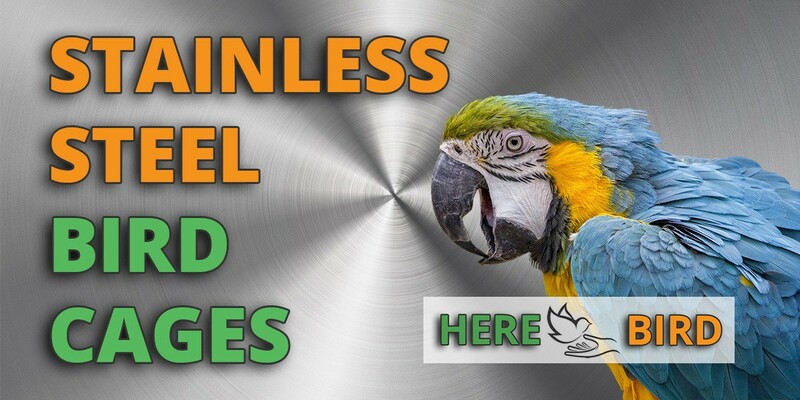 What’s consistent with stainless steel bird cages is that they all are made to a higher standard, are longer lasting and can provide a better experience for you and your birds. However, the hefty price tag may put off some bird owners. Those looking for the best value for money stainless steel cage should go for the option above from Prevue. Whereas the best overall overall bird cage (which is perfect if you have the budget for it), would be the Heliconia Hideaway.